Huawei announced its one-day pre-order promo for its latest premium smartphone series – the P30 and P30 Pro. Consumers can get almost Php32K worth of freebies, if they pre-order the P30 or the pro variant. In case you missed it, one of its default freebies is the new Huawei Watch GT which costs Php12,990. However, the tech giant revealed that customers who will pre-order the series today will score an additional tablet. 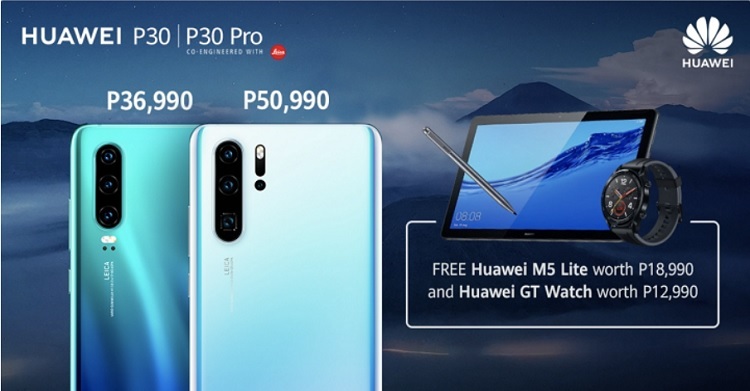 Happening today, April 6, 2019 at 11AM, the first 40 customers who will pre-order the P30 or the P30 Pro at the Huawei Experience Store in SM Megamall will be given a free Huawei MediaPad M5 Lite, which sells for Php18,990. Meanwhile, Huawei explained that consumers have to give a Php20,000 downpayment to enjoy the special pre-order promo. The Huawei P30 is priced at Php36,990, while the P30 Pro is tagged at Php50,990. What can you say? Is it a yay or a nay?